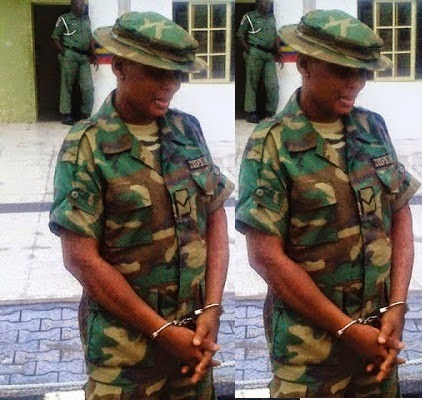 Ondo State 323 Artillery Brigade of the Nigerian Army, has arrested a woman who goes by the name Angela Omieh, for posing as a soldier. Among the things recovered from the woman was sets of military uniform, police extract and a sworn affidavit for loss of her military identity card. Captain Ademola Adegoke who is the Public Relations Officer of the brigade told reporters that Omieh was arrested following a report by her boyfriend. According to him, Omieh who stays in Mile 3, Diobu, Port Harcourt, Rivers State, was caught to be in possession of two pairs of army camouflage, camouflage T-shirt and short, one pair of desert boot, one jungle hat and three handsets. He also said the suspect had been parading herself as a soldier attached to the 149 Battalion, but deployed to Joint Task Force, Warri, Delta State for duty. Ademola revealed that the suspect’s boyfriend, Mr. Collins Jegede, revealed how he met Omieh on a social network with photos of her dressed in military outfit. Mr. Jegede who then wooed her and she paid him a visit in January 2014 in full military uniform. Jegede also reciprocated the visit, by visiting Omieh but was shocked to see that she was living in a hotel at the Ijaiye area of Lagos State instead of 149 Battalion, Ojo Military Barracks, where she had claimed to be posted to. The suspect Omieh admitted that she was a fake soldier, adding that it was meant to make ends meet after her father died which led to her drop-out from school. She also added that she bought the military uniforms from Army depot in Zaria.